RCP manufactures both Contraction and Expansion style dowel baskets meeting the requirements of numerous state and federal agencies as well as commercial construction. 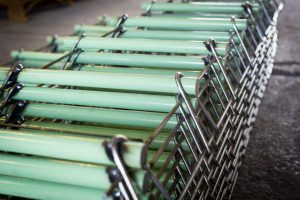 Baskets can be manufactured to fit your needs and are available in Plain Dowel/Plain Frame, Epoxy Dowel/Plain Frame, Fully Epoxy Coated, and Fully Painted/Half Painted Assemblies. Also available, Tectyl 506 and M202 Asphaltum bond breakers. RCP manufactures Tie Bar Baskets with numerous options of bar sizes and lengths, heights, dimensions to meet your needs. Available options are, Plain Rebar/Plain Frame, Epoxy Rebar/Plain Frame, and Fully Epoxy Coated.